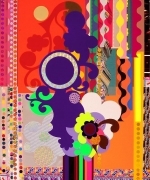 James Cohan Gallery is pleased to present an exhibition of new works by artist Beatriz Milhazes, opening October 11th and running through November 15th 2008. As one of the most celebrated Brazilian artists working today, Milhazes' exuberantly colored, rhythmically constructed abstract paintings, collages, prints and architectural installations are well-known worldwide. Milhazes merges all of the formal concerns inherent in abstract painting with a dizzying hybrid of influences that bounce off of each other to produce works in which, as the artist describes, "culture eats culture." In her attempt to make the viewer's eye "spin around," Milhazes deftly uses images as a distribution system for color. In this third solo gallery exhibition, Milhazes will present a selection of collages and paintings. 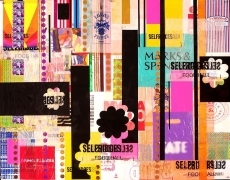 In the exhibitions, the paintings have been the inspiration for the artist's other endeavors, such as her collages made from chocolate candy wrappers, shopping bags and colored paper and her installations on building façades. In this latest body of work however, the reverse is true; the paintings, whose surfaces are built up from an elaborate process of transferring motifs painted on plastic sheet, are increasingly influenced by the immediacy of working with small bits of paper and the bold strokes of large-scale architecture. This shift, as well as a deepening involvement in nature — the artist's Rio de Janeiro studio borders her beloved Botanic Gardens — has influenced Milhazes' new work, making it even more rigorously structured with broader fields of color and new elements derived from abstractions of natural and architectural forms. Not afraid to gather inspiration from sources such as Brazilian folk arts and decoration, Milhazes embraces these "low" art influences and balances them with the high-minded modernism that was brought to Latin America by an earlier generation of artists such Helio Oticica and Tarsila do Amaral. Mix in the rhythms and grooves of Tropicalismo, the spectacle of color that is Carnival and the over-the-top ornamentation of the Colonial Baroque and the paintings exemplify "anything goes"—an apt phrase coined by the Neo-Concrete artist Waldemar Coreiro in the 1960's. As Paolo Herkenhoff explains in his catalogue essay for Milhazes' exhibition Mares do Sul, rather than trying to create a destabilizing effect, "Milhazes aspires to encountering harmony in the absurd, her painting not being the collapse of order but that moment that follows vertigo." 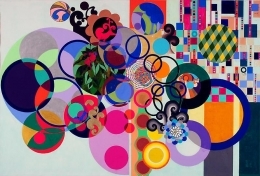 Beatriz Milhazes is participating in several important exhibitions and events in the exhibitions year. Milhazes is the subject of a major survey exhibition at the Pincoteca do Estado in São Paolo, Brazil opening on September 6th 2008. Another solo exhibition is planned at the Fondation Cartier in Paris opening March 2009. Both of these solo exhibitions will include site-specific installations on the windows of the museums. Milhazes will be participating in a number of group exhibitions this fall including When Lives Become Form at the Museum of Contemporary Art, Tokyo, curated by Yuko Hasegawa, opening October 21st; the Prospect 1 New Orleans, the largest biennial of international art to be organized in the US, opening October 31st for which she has been commissioned to make a chandelier-like room installation. Conexhibitions with the Frieze Art Fair in October 2008 will be the launch of Milhazes' new artist book published by Ridinghouse, London, UK. In addition, The Rug Company, London UK will be launching a new limited edition artist tapestry project in October 2008 for which Milhazes has created a work and New York fabric manufacturer, Maharam is producing a line of artist's fabrics that will include a design by Milhazes also to come out this fall. 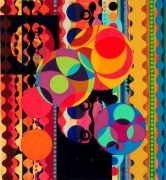 Milhazes has exhibited widely in museums around the world and has represented her country at the 50th Venice Biennale, 2003. She has participated in many international biennial exhibitions including; Shanghai Biennale, 2006; XXVI Bienal de São Paolo, 2006 and 1998; the 11th Biennale of Sydney, 1998 and the Carnegie International, 1995. 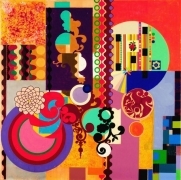 Milhazes was born in 1960 in Rio de Janiero, Brazil where lives and works today. For further information about the exhibition please contact Jane Cohan at jane@jamescohan.com or telephone 212-714-9500.